A. Dental sealants are permanent plastic barriers applied to the biting surfaces of teeth. They prevent cavities by filling in the grooves and fissures where food particles are particularly difficult to remove. 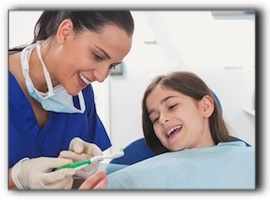 Most Phoenix pediatric dentists and family dentists offer sealants to their patients. A. Do sealants significantly reduce tooth decay? Q. Yes. Studies show that dental sealants can impair the risk of decay by 70%! Q. How are dental sealants applied to the teeth? A. Your dentist applies the sealant resin as a liquid which quickly hardens and adheres tightly to the pits and grooves. The procedure is rapid, manageable and painless. Q. Which teeth can benefit the most from sealants? A. Sealants are most commonly applied to the first and second molars because they are at the highest risk for decay. Q. When should sealants be applied? A. The best time is early – while the teeth are cavity-free. Your dentist will advise you. Q. Are sealants just for kids? A. Not necessarily. Talk to your Chandler dentist about whether sealants could benefit you. Q. Is brushing and flossing still necessary for the teeth with sealants? A. Yes. Vigilant oral hygiene is still critical to keep teeth and gums healthy. Even the teeth with sealants are at risk for decay along the gumline.